Although it's bad, I love losing self control and caving in to the foods I love. world class chocolate from baskin robbins is one of my favourite, I don't know if it's my favourite ever though. I like peppermint stuff too (love the peppermint mocha from starbucks), but my bf hates mint anything (except mint gym) it's pretty funny. Do you twitter? I noticed that I don't have you on mine. @ Schumitza.. Lemon is delicious -especially on a hot day. Or lemon italian ice (so good!) I'd love to try melon ice cream too. I didn't know Greeks made some of the best ice cream.. I NEED to try it now! @ Justine.. I love chocolate but I can only eat it in small amounts or it's "too chocolate-y" for me. I love mint ice cream too -but without the chips. @ Justine.. P.S. I live in the dark ages LOL. I need to get with all the new technology! @ Everyone.. I didn't realize I was on this account! This is my super boring account for school -I made a blog for my class. Most of it is terribly written because I do it last minute. =P Have a look if you like but you've been WARNED. My favourite flavors are chocolate,vanilla and mango we don't have peppermint flavor here :( so I have no idea how it tastes like.I checked your class blog, are you studying graphic designing? Mmmm, I want ice cream now! I love mint chocolate chip! I've had ice cream at BR before but i've never bought a tub and took it home to eat! LOL. Sad. I love BR ice cream but if i don't buy my ice cream from No Frills, my parents will yell at me. No luxury ice cream allowed in Pam's fridge. Your tub looks yummy! Will try peppermint someday soon! In my opinion Greeks make even better ice cream than Italians. Theirs is more rich, more soft and buttery if you can use that word to describe ice cream hehe while italian one is more icy..dunno, just feels different. I've had it in both countries and while Algida (from Italy) is one of my favourite ice cream companies I like more the one Greeks sell in ice cream shops. You definetly should try melon, watermelon is the best while yellow melon comes a close second. @ alvira.. I love mango! Have you tried Mango frozen yogurt? It's one of my favorites. I am actually an advertising major but I have to take the History of Graphic Design Course -it's REALLY slow but the images in the textbook are always amazing. @ Pop Champagne.. Love cookies n' cream too! BUT OMG.. bubblegum is one of MY faves -especially when there's bubblegum pieces. I almost always get that if there's not peppermint. And corn?! Sounds.. interesting but not too appetizing. @ Pamela.. LOL! Well for my birthday, my mom got me a (second) cake but it was strawberry ice cream and chocolate cake. She knew I liked the peppermint so she got me a separate tub since I wouldn't be eating much of the cake. SO since then, it's been all about Baskin Robbins tubs! Plus, they're perfect for eating a little at a time. =P Can't wait for you to try peppermint!! LOL..
@ Schumitza.. I've had Italian gelato (which is great) but never from the Greece so I NEED to try this stuff. Melon sounds so so good!! 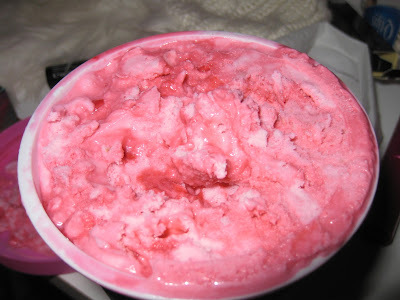 I've had melon frozen yogurt, which is good, but I WANT melon ice cream! I'm the same with chocolate -too much will make me so sick of it. That's why I only eat chocolate a little at a time. I LOVE peppermint ice cream too! I've never had Baskin Robbin's peppermint ice cream, though...I usually get the Dreyer's one and it's delish! Haha! Well, i like gelato over ice cream so most of the time i get gelato.If i do get ice cream i like grapefruit. Some people dont like it but i love it! I looove peppermint ice cream too! I was so excited when Edy's released their limited edition of it. But I was disappointed at the huge amounts of artificial colors and flavors in it. I guess I've been so used to avoiding that stuff, when I had it again, it left a funny taste in my mouth, and it didn't really taste like quality ice cream? They really don't need all that red dye and junk in it! I love the mint chocolate chip ice creams that are white (no neon red or green colors!) and naturally flavored. Mmm. I love the white mint ice cream -have you tried Häagen-Dazs' "Five" ice cream? It's so good! No chocolate chips though. In East Malaysia, where I am, we don't have Baskin RObbins, at least yet. 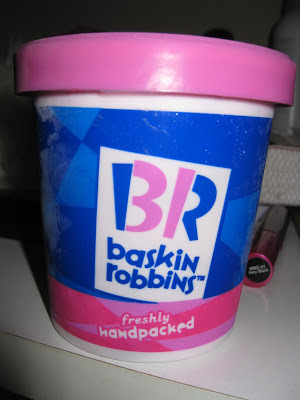 But at my BF place (West Malaysia), Baskin RObbins is only 5 minutes drive from his house. I only got the chance to try some, but I love Black forest, Caramel Turtle (i think) and Green Tea. Since I'm going to my BF place for christmas holiday, I can't wait to try Peppermint. I've never tried any of those 3 flavors but they all sound delicious! Maybe you can take a small carton to-go to keep at home -that way you can have some to last you for awhile. I hope you like the peppermint!